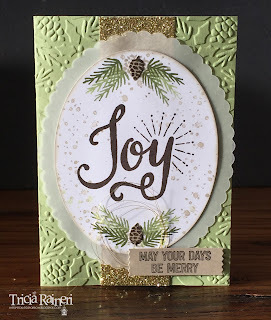 Welcome to Week 4 of my 12 Weeks of Christmas series. Today I am sharing some little gift bags I made as gifts for attendees of my Create Your Christmas event I held recently. I was looking everywhere for my Mini Treat bag die, but alas it is hiding somewhere. So instead I got out the Gift Bag punch board & as I only had a short amount of time to prepare these. It was the perfect choice & I managed to make 15 of these in an hour. A pack of Season of Cheer DSP & some fast fuse later I had me a nice little bunch of thank you gifts for my customers. Here they are all lined up ready for the guests. I used the Note Tag punch for the little label to the front. I just punched both ends with the arch. These bags are the SMALL size on the punch board. The great thing about the punch board is it has directions for each size. This small bag is a good size for lollies or treats, jewellery & even cash. If you are using paper that has a direction, remember to punch it upside down, as the board makes the bottom part of the box at the top of the board. I made a few upside down ornament ones before I figured that one out! Welcome back to the CASE-ing the Catty blog hop. 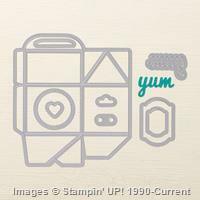 This week we are focusing on pages 46-49 of the Stampin' Up! Holiday catalogue. This week it's the Halloween section, YAY what fun! We don't celebrate Halloween here in Australia, however, the estate where I live does get involved, so we are busy decorating & getting ready for the trick or treaters. 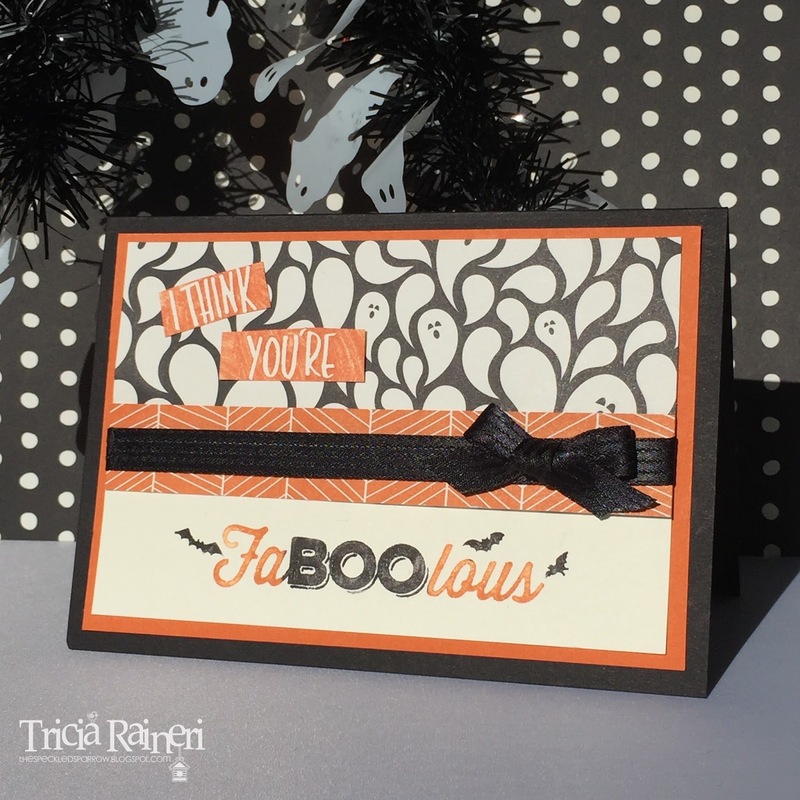 I couldn't help myself this week & made 2 fun cards celebrating Halloween. For my 1st card I've used the fun Happy Haunting DSP & have teamed it with the stamp set "I Think You're Great" from the annual catalogue & the hostess set "Six Sayings". 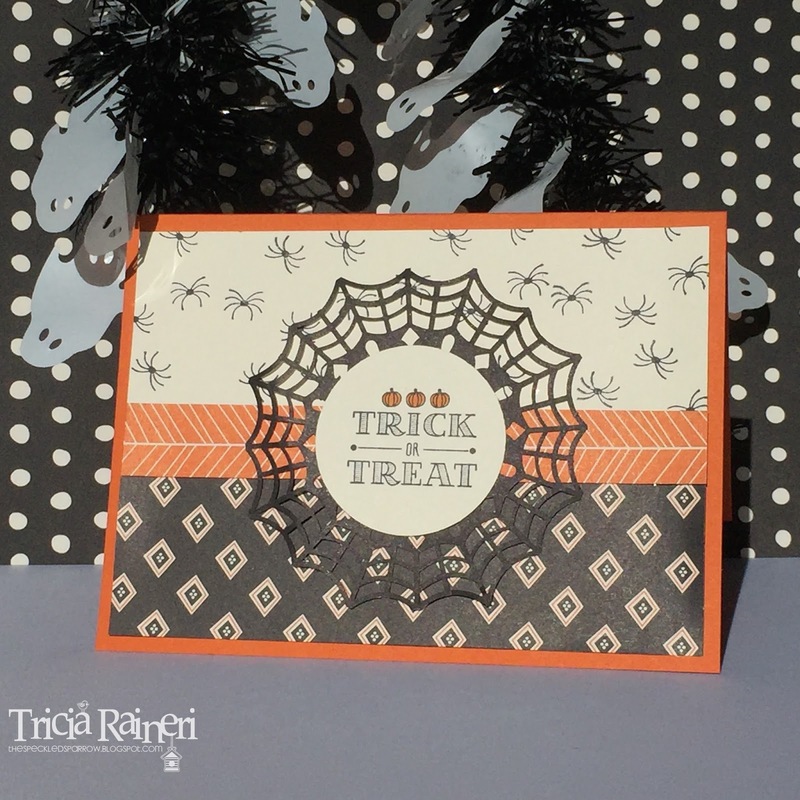 For my second card, I have used the same DSP but have added a cute spider web doily & the trick or treat stamp from "A little something". 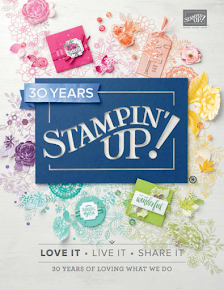 This stamp set is super versatile as it has a bit of everything for this time of year in it! After looking at these projects, I still wasn't happy. I needed something to hold the treats in so I created a little goodie bag using the same ingredients as the trick or treat card above. 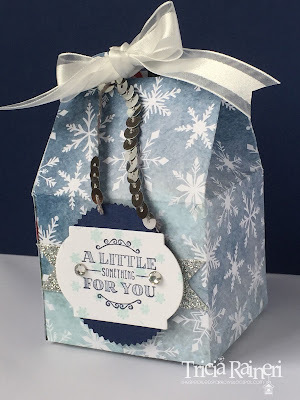 I used the Gift Bag Punch Board to whip up a quick bag. 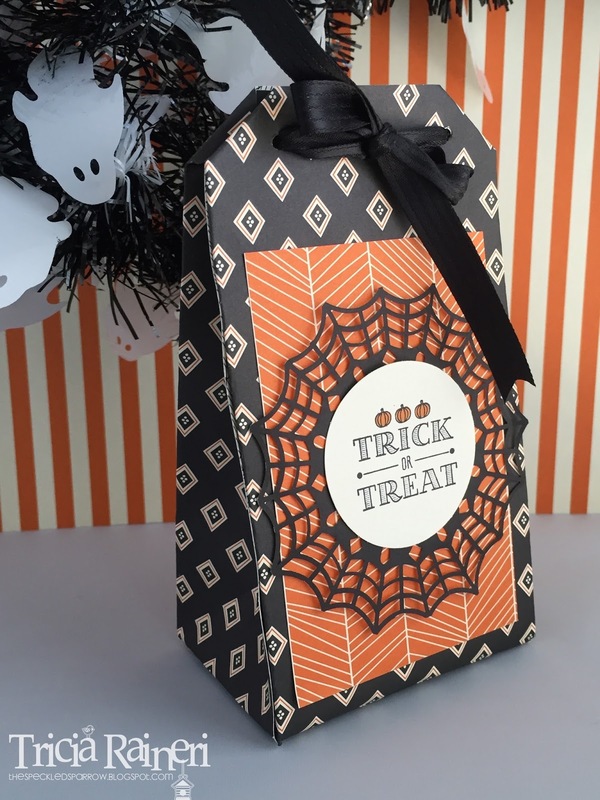 This one is medium sized which is perfect for chocolates & treats. I hope you have enjoyed my projects. Next stop on the hop is Alison. 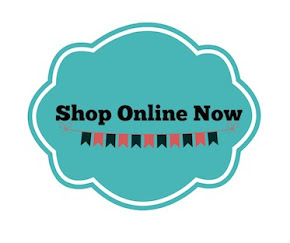 Click on the next button to hop on over to her blog now. Remember if you get lost you can always go to the CTC blog & see the full list of participants. Here we are again for the week 3 installment of my 12 Weeks of Christmas series. 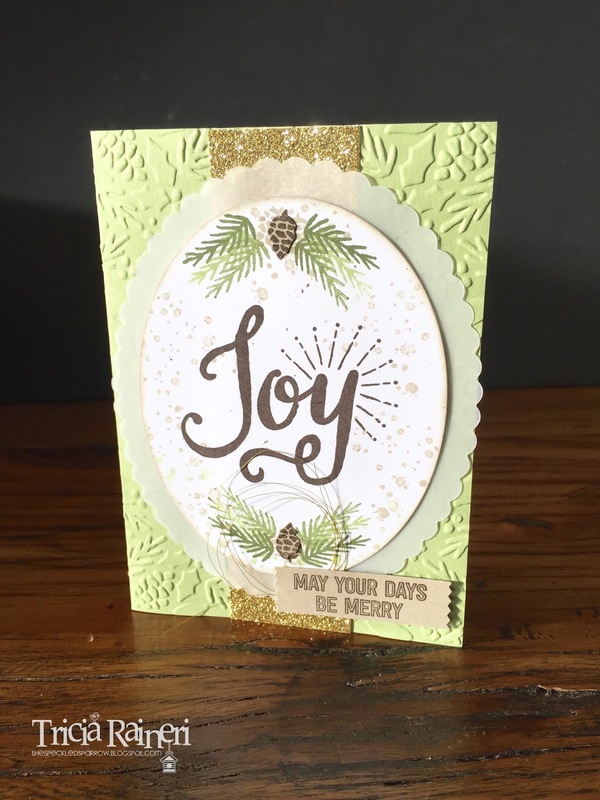 Every year around this time I hold a Create Your Christmas event for my customers where they get to make lots of cards to hand out to family & friends. 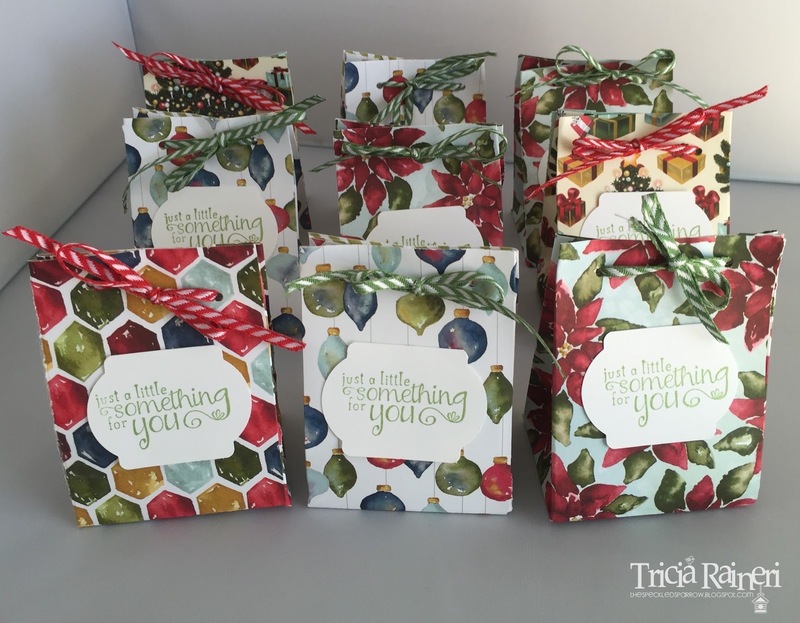 I try to use as many new Holiday products as I can at these events & always provide their kits in a pretty gift bag. 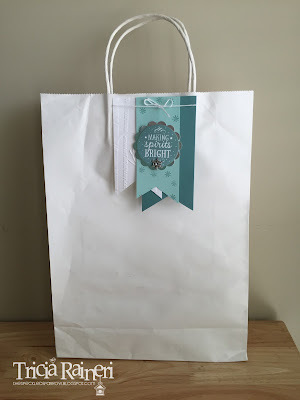 My Gift bags need to hold lots of goodies, but also need to be pretty. Today I am sharing my gift bag design using "Among (or Amoung if you are Australian) the Branches stamp set & the Woodland embossing folder. 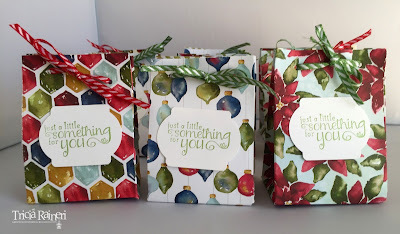 I saw something similar to this on Pinterest recently by Julie Davison & I just loved it so much I decided to make my gift bags for my Create Your Christmas day to match it. And here is my stepped up version made into a card. I like to design my gift bags so that my customers can create a card out of the decoration on the front each year. I then display a card I have made with it so they can go home & make it. It's all about recycling here! I just love these blues & silvers together. Just a hint...you will be seeing these colours again this Christmas! Be sure to check back next Friday for my Week 4 Project. Welcome to the CASEing the Catty blog hop for this week. 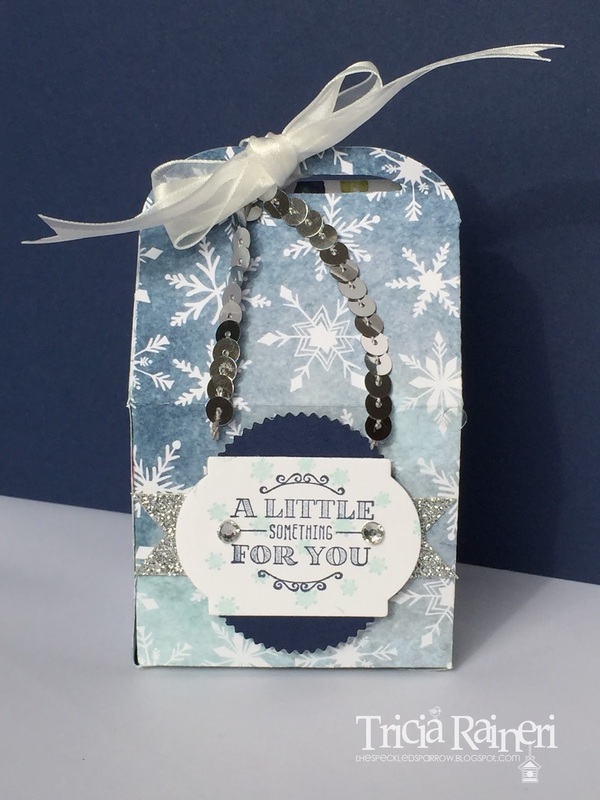 Today we are creating using the very lush suite, Winter Wonderland on pages 22-27 in the Holiday Catalogue. This is one of my absolute favourite suites & was the one I was drawn to the first time I looked through the catalogue. I think most of my preorder consisted of everything in this suite! I have created lots & lots of projects from this section & will be sharing them later on in my 12 weeks of Christmas posts commencing on the 9th of October, going right through until Christmas eve. This week I have chosen to CASE the shaker card on page 22 of the Holiday Catalogue. I loved the crisp black, white & gold feel this card has, plus I wanted to try out a shaker card. 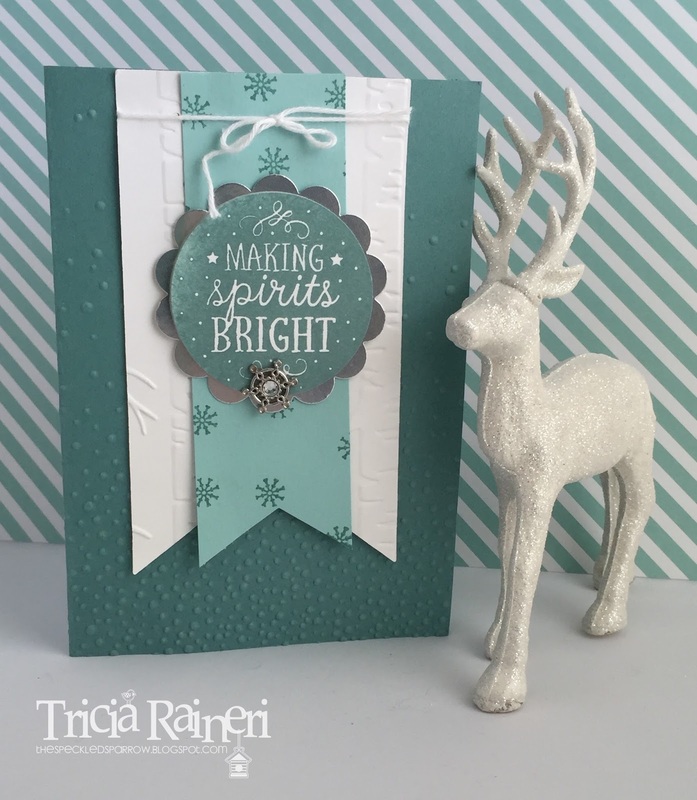 I chose to use the Winter Wonderland Specialty DSP. Now this DSP is REALLY lush with gold, black & white. It is a shiny thin paper, which makes it feel expensive & extra special! Here is a side view. I quite like a square card, but this one will need an envelope made as its quite large at 15cm x 15cms. I have added a sheet of the Winter Wonderland Vellum stack. Oh my, this stack is stunning. 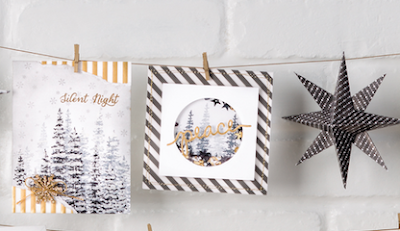 If you love vellum you will love these gorgeous prints. 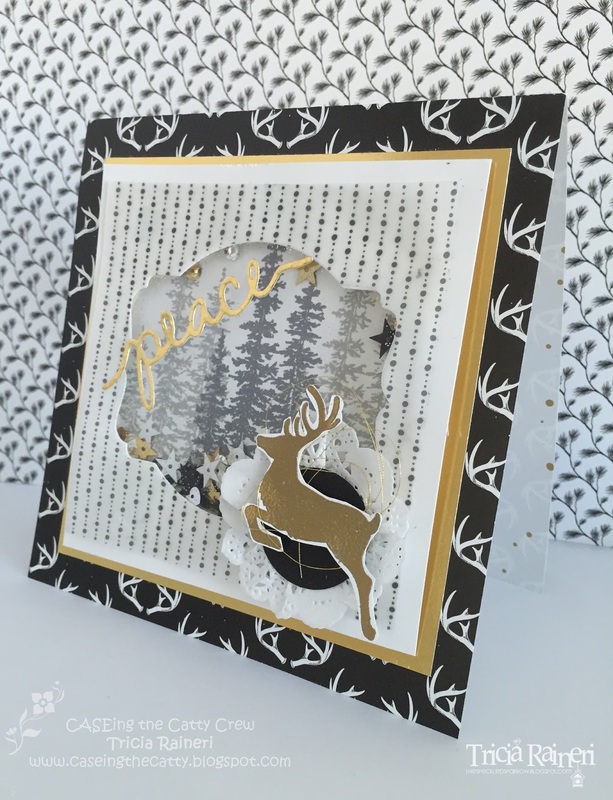 The deer to the right corner is from the stamp set Jolly Christmas, which is also in this section of the catalogue. The other thing you will notice is the metallic sequins in the shaker section. They match this DSP perfectly & are from the annual catalogue. 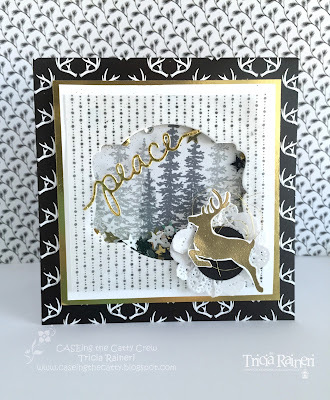 I cut out the middle of a doily & made a mini one for an added embellishment behind the deer. I hope you have enjoyed my shaker card today. It's now time to continue the hop to Judy's blog. To see her project just click on her name or the next blog button below. Remember if you get lost you can always head on over to CTC blog to see the full list of participants. Welcome to my annual 12 weeks of Christmas posts. 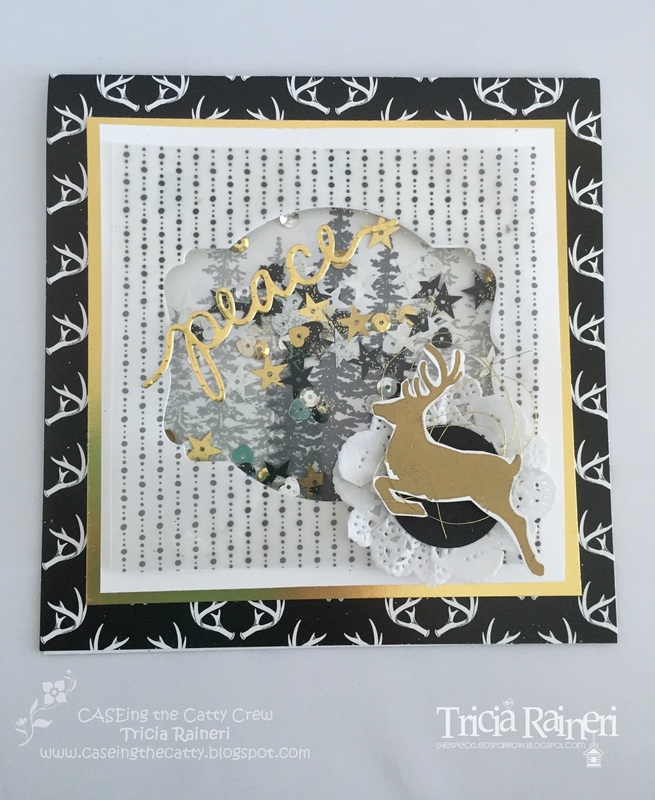 Every year I run this popular series where each week I make something to inspire your Christmas creating. I make all kinds of things from 3D, gift projects & also cards. I think it's time I got all my Christmas decorations down from the garage. Time to start thinking Christmas... not long now! 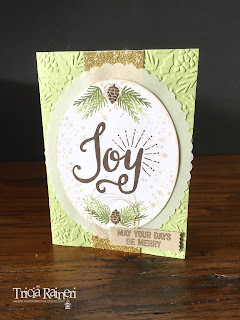 To start us off I have created a Joy card using the Berry Merry bundle from page 30 of the Stampin' Up! holiday catalogue. 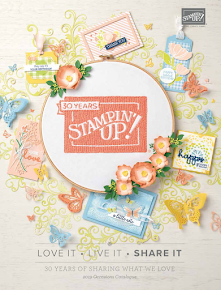 We created this card last month for one of our stamp club projects. I love a bit of Pear Pizazz & Early Espresso for Christmas. Those demonstrators amoungst us might recognise this card from one of the US convention stage presentations, but I have changed it up a bit to suit what I had. 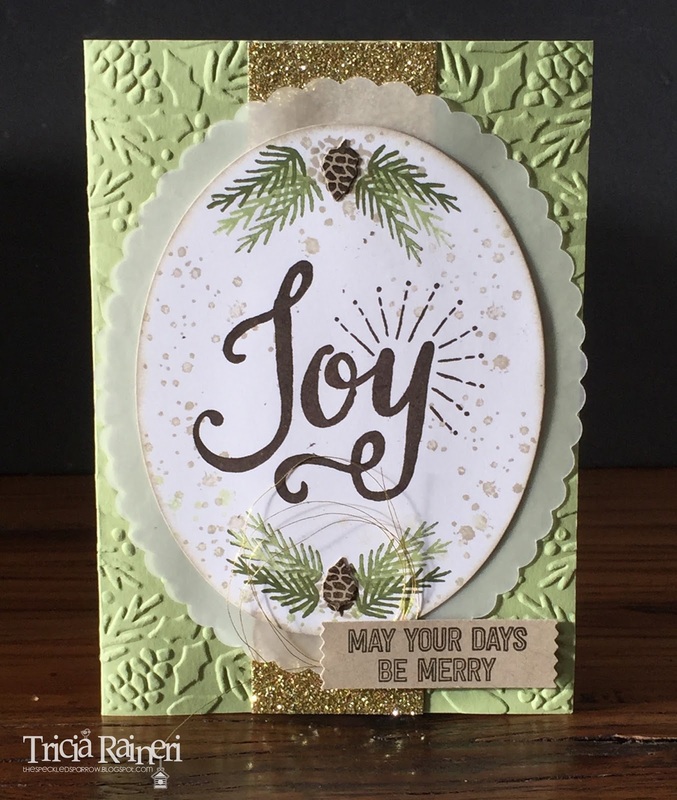 I love this Boughs & Berries embossing folder that comes with the Berry Merry bundle & have made a few creations with this folder, so make sure you check back in for those. For those of you who love the CTC blog hops, we have changed to Sunday night now, so come back then for my next blog hop post. I have created a Christmas shaker card, especially for the hop.